The Maui Team is happy to announce the release of Maui 17.03 – Cuba Libre. 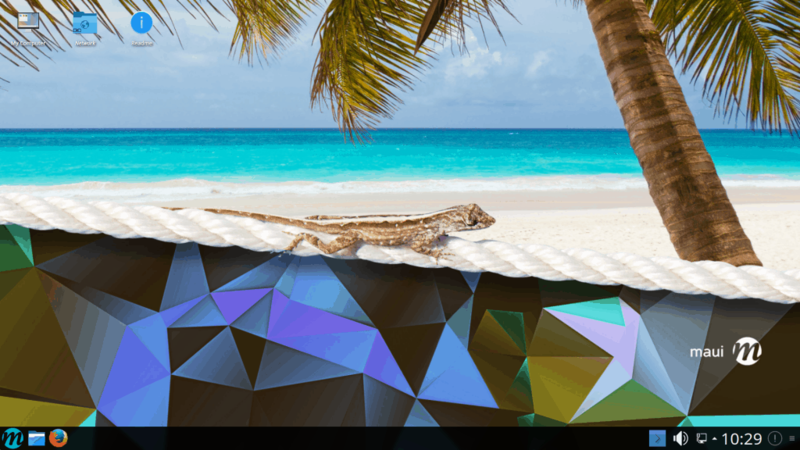 This release comes with plenty new package updates and KDE Plasma 5.9.3. It also ships Frameworks 5.31, Qt 5.7.1 and LTS Linux Kernel 4.4.0~65. Firefox was updated to version 51 and Thunderbird to version 45. Calamares has been updated to its latest version 3.1. This release restores the Minimize All functionality as a hot corner trigger (instead of the default “Show Desktop”). Touching the lower right corner once with your mouse cursor minimizes all windows, while doing it right again brings them all up in the previous order. If you continue with something else after minimizing, they will STAY minimized and not move up and in your way again. We now ship the Plymouth kcm in the system settings, which allows easy installation and switching of Plymouth startup themes. Started with the previous Maui release, we continued to update our repository S3 infrastructure. Our goal is to provide a very stable user experience with the option to have ongoing updates of KDE software. 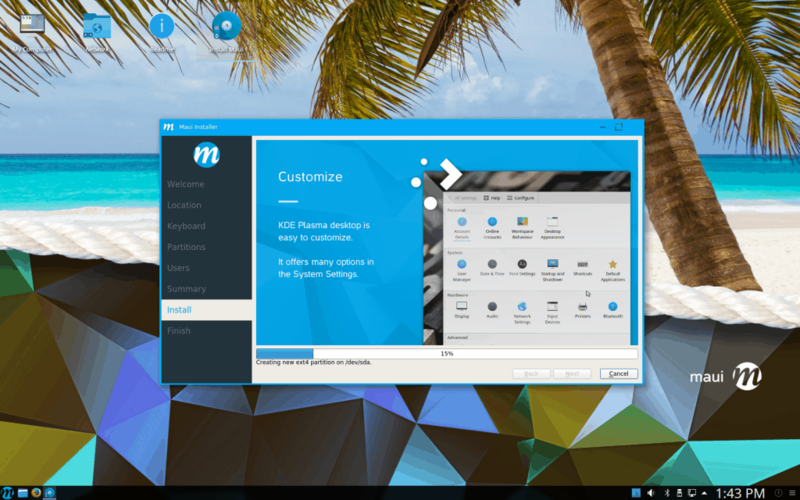 Therefore we are providing part-rolling releases of KDE Neon packages, allowing us to test new updates to Maui’s base thouroughly, while allowing everyone to decide for themselves if or when they want to update to a newer available Plasma or KDE Frameworks 5 version. Will there be an upgrade path from Maui 2.1? Yes, backports will take a week before ready or via script, which will take 2 weeks. Не установилась. Сейчас даже не вспомню, почему. Вернулся на любимую ROSA. А у меня взлетело. Правда по инструкции не хотели переустанавливаться пакеты plasma-desktop[-data], пришлось их снести совсем и переустановить. А ROSA всё ещё на 4-х кедах сидит? Very nice, thanks for all your work to provide this update. Look forward to try it. What do the version numbers signify? It’s quite a ‘jump’ going from version 2.1 to 17.03. Will there be a version of Maui based on NEON/KDE LTS for those who want something more stable? By the way I love the new Simple Menu. In Maui 2 discussion it was stated that a more graphical program manager will be coming in version 3 (which I assume is 17.3) but I can only find synaptic package manager, which I, being a Linux newbie, do not find particularly intuitive or informative. I was keeping an SSD aside for this but it looks like I will have to wait longer. With Win10 refugees looking for somewhere to go this looks like a superb distro but a more intuitive and graphically informative program manager such as you find in Mint would be the icing on the cake. How far away would this be? you’re absolutely right that a graphical software manager would be great. Unfortunately KDE’s own tool Discover somehow has still issues which for such an important tool we can’t ignore. We are still testing alternatives, but shipping Gnome-related tools like Gnome Software Center seem to be quite bloated solutions dependency-wise, therefore maybe we ship the mint store in the future, after making sure it works the same under Maui as under Mint.